Here it is...washed and lightly ironed. Another view. I've pointed the last block with an arrow.The stitches used are long and short stitch and fern stitch. I plan to stitch this block again on another cloth just to get the hang of L & S. I must admit,before I started this stitch, I had a lot of inhibitions - but as I progressed, I found myself enjoying the intricacies. Here is one more pic. The otherwise perfect ending was marred by two things - one,entirely my mistake and the second,not under my control at all. After I'd washed the sheet and hung it out to dry, I noticed the color of Kashmir work block running. I soaked the section a couple of times to lighten the colors. The next issue was the shape of the wreath. The section near the long and short block and herringbone block is a little squished. It now looks as if someone has taken a bite out of the floral pancake. I think I can correct it if I add a few lazy daisy flowers there. 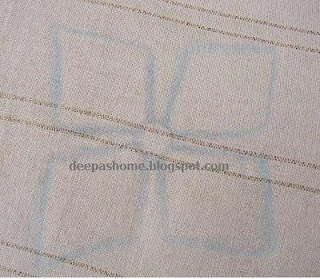 Click on the pics above and look for the 'deepashome.blogspot' watermark to see the problem areas. Aaahh...that's it,then...Thanks to all my lovely blogland friends who've been very encouraging with their comments and suggestions.It truly was a great learning experience. Was it useful for you too? If anyone needs the pattern for any of the blocks please leave a comment here. 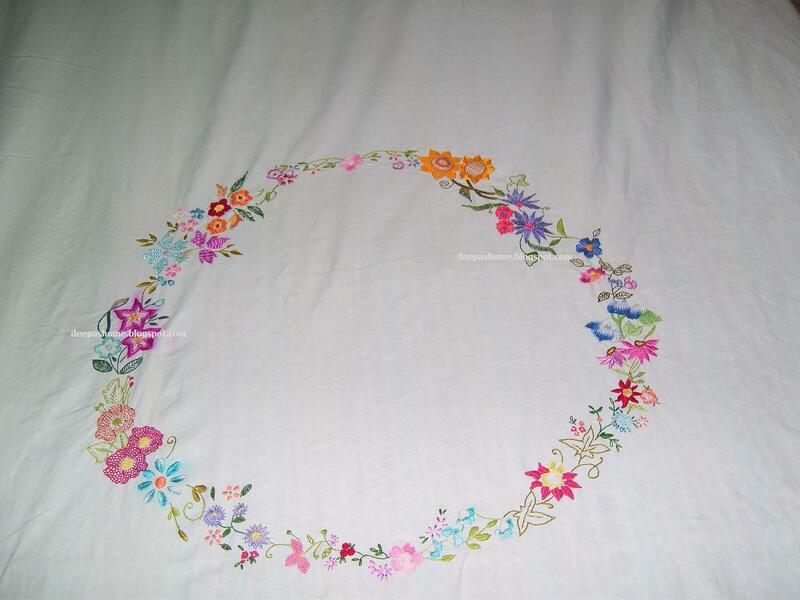 I do not have a scanner,but I can take a closeup photograph and post the pic.Do let me know if you're keen on embroidering any particular block. Has anyone been trying these stitches alongwith me? I would love to read about your attempts too.The links for the entire bedlinen project have been listed here. It is also available in the sidebar. Now that I've completed this,the question that has naturally comeup is - what next? - Oh, there are plenty of stuff to be tried ,tested and learnt - drawn thread,needlepoint,black work,dimensional embroidery...the list is endless.Indian embroidery also cannot be ignored for long. Let me take some time and decide. I'll let you know what Iam upto in a few days. Absolutely gorgeous, Deepa! Sorry about the running color. Do you think a bleach pen would work on it? Be sure to neutralize it after. Congratulations with your finish, you did a marvellous job! This looks soo lovely. Congrats on finishing this Deepa.. I loved all the WIP posts. Each block has come out so well. The sunflower block is my favorite. I hope you can do something about the herringbone block. Enjoy reading your blog. Eagerly waiting to see what you'll do next. Deepa, absolutely brilliant and gorgeous too! How sad about the one set running... that is very frustrating, however, it gives it the character of an heirloom handmade piece that can never be replaced. 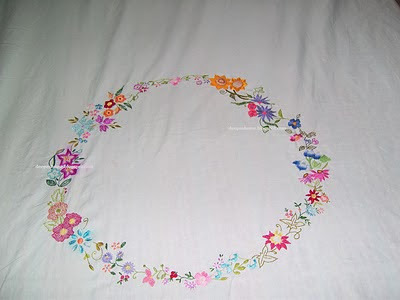 As for the "missing chunk", I definitely think you can bring it in line with "circle" by either adding some little flowers as you say, or matching vines to the blog. Great job, can't wait to see what you work on next! Hugs. Congratulations Deepa! What a fantastic job!! I totally agree with you on the l&s stitch - intimidating, but good fun. It is really nice to see ur work completed... Congrats. The outcome is superb. Me and my friends were eagerly waiting for each post. We really enjoyed each sessions very well. For me the spiral trellis stitch of the sunflower block found more interesting. This is the first time I've heard of bleach pen.Iam not sure if we get it over here.Let me check out. The work is just beautiful. Inspite of the problems you mentioned, the word still looks beautiful! I would love to work on several blocks of this design, but now I'm in the middle of making some handmade embroided cards. Once I'm done with them I will check with you to find out if you can email me pics of the blocks. Thanks and looking forward to seeing your next project! Hi Deepa! 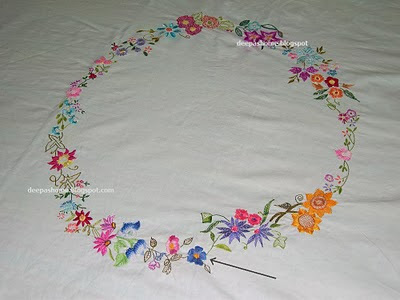 This is lovely and I want to try some of your stitches in these projects for sure! WOW Deepa..its absolutely gorgeous n lovely...i just cudn't stop admiring it...great job!! 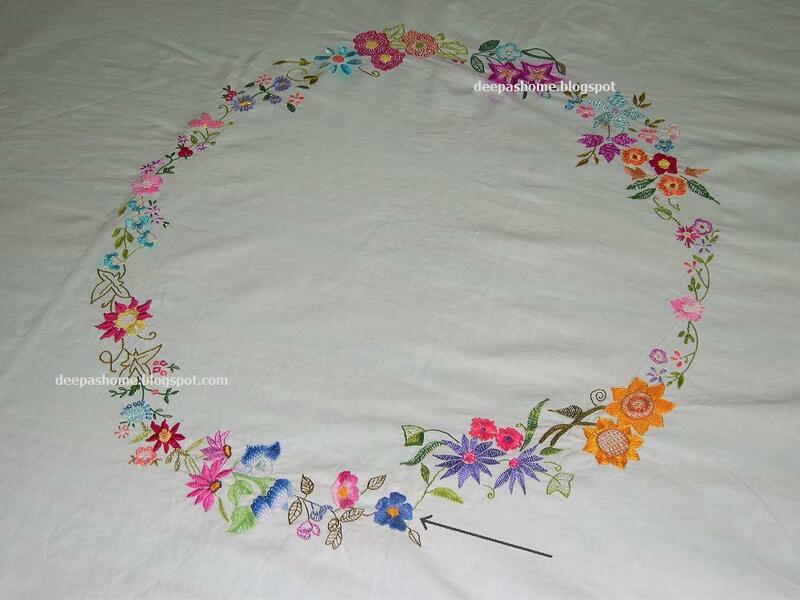 !hope to see more soon...R u going to do pillow covers to go with the sheet? congratulations for completing such a great job! It's really really nice. Looking forward to your further projects. 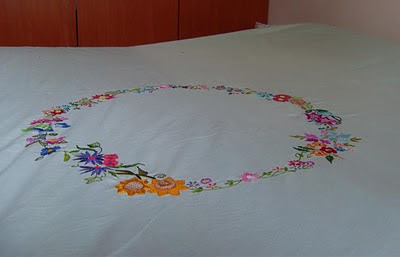 But it was good to see some embroidery with no repeating patterns. The end product is really eye-catching and worth the efforts of months. Thanks for blogging the details. Talent in true colours.Unless you make a mention these flaws are not visible.Artists are experts in corrections.Looking forward for the next project. The bedspread looks stunning and so very colourful.Great work. This is so pretty! I love how it looks. You did a wonderful job. Deepa, absolutely gorgeous you must be very proud of this.